For as long as I can remember, I dreamed of becoming the next Vin Scully. It's a common enough dream, but one that felt audacious as a kid growing up in southeast L.A., the child of immigrants, speaking Spanish at home and fighting to convince the teachers I could succeed in English-language classes. And while I'm not calling Dodgers games yet, I have come a long way from my days as a 9-year-old calling play-by-plays for "Bases Loaded" on my Nintendo. In 2009, I earned my master's degree in sports management from CSU Long Beach. I remember walking off the stage, carrying my diploma — so proud of what I had accomplished, but with no idea of what I would do with it. 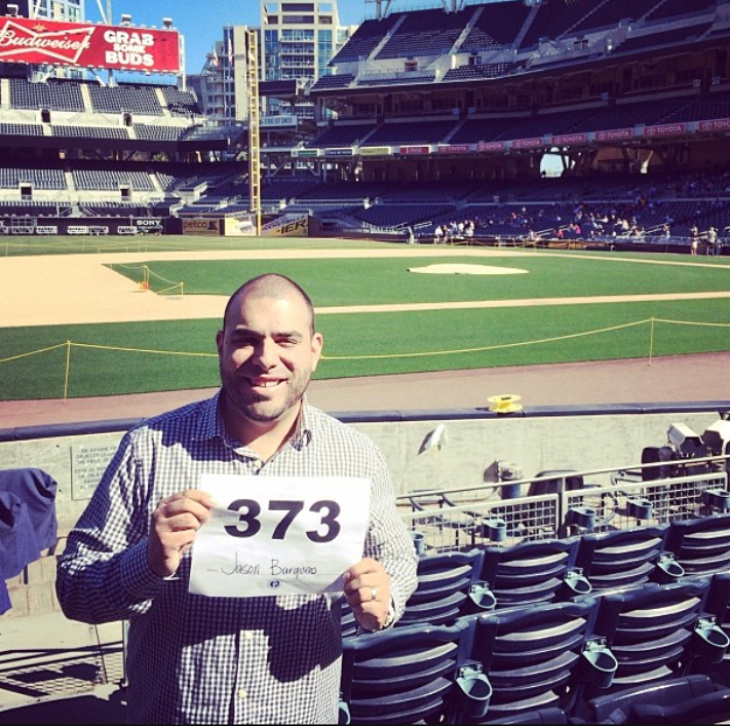 It wasn't until four years ago, when I saw an ad for open auditions to become the stadium announcer for the San Diego Padres that things started to change. I had no intentions of moving to San Diego, but two of my good friends insisted I audition. They even offered to drive. We headed to San Diego one Saturday at 6 a.m. and got in line at Petco Park. So did 700 other people. Only 450 people were allowed to audition. I was number 373. After seven hours, they finally called on me. I walked down a field-level aisle right behind the dugout, was handed a script, and given a couple of minutes to rehearse in my head. Then, it was my turn to walk up to a mic. I belted out, "Third baseman - Chase Headley." And to prove to them that I could pronounce names en español, "Yasmani Grandal." I left that day with no expectations. Two weeks later, I was one of 30 finalists to make it to the next round. Then, I became one of 20. Contestants were assigned a Twitter hashtag and had to persuade people to vote for them. That's when I realized how many people I had on my side. My supporters pushed me into the top 10, and I was invited to be the announcer for the first five innings of opening day at Petco Park. As luck would have it, we played the Dodgers. And, yes, Vin Scully was sitting only a few booths away. In the end, I didn't get the gig. But I did get my start. A journalist who had covered my Padres experience sent me an announcement that the Lakers' minor league team, the L.A. D-Fenders, were looking for an announcer. After a round of American Idol-style auditions, I received the email that would change my life: an invitation to be the D-Fenders' announcer for the 2014-2015 season. This spring, the Lakers front office asked whether I was ready to fill in at the big show - Staples Center. With only 24 hours to prepare, I walked into Staples Center on Easter Sunday to announce "the team with 16 NBA championships - your Los Angeles Lakers!" Among the 17,000 cheering fans were my parents. They saw me through everything — from my struggles in elementary school to attending Cerritos Community College, where I had my first radio show and my first feeling of belonging. They had been among the voices who encouraged me, like many first-generation college students, to get a "real job." They've been there to see me with the D-Fenders. Then with the Lakers. And now, as an announcer for L.A.'s newest professional soccer team - Los Angeles Football Club. And it was their support that helped me to embrace audacity. When it came to the LAFC gig, there was no announcement. No job board. It was just me pestering the LAFC, before they finally hired me. I hope someday they'll get to see me accomplish my ultimate plan: to have my voice booming over the loudspeaker at every sporting event in L.A..
As fans leave the game, they'll recognize my parting words: "I'm your announcer Jason Barquero. Have a good night and please drive home safely." 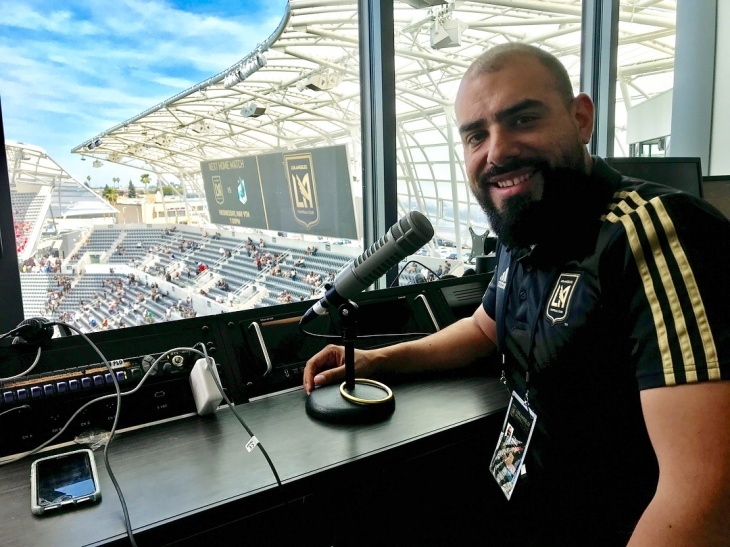 Jason Barquero is the public address announcer for the Los Angeles Lakers G-League team, the South Bay Lakers, and L.A.'s newest Major League Soccer team, the Los Angeles Football Club. When he is not talking to sports fans over a loud speaker, he is spending his time helping college students and alumni achieve their career goals as the executive director of career services at Otis College of Art & Design.